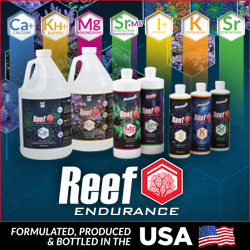 As many of our readers know, Red Sea manufactures some of the nicest looking aquariums on the market, with great features at reasonable prices. 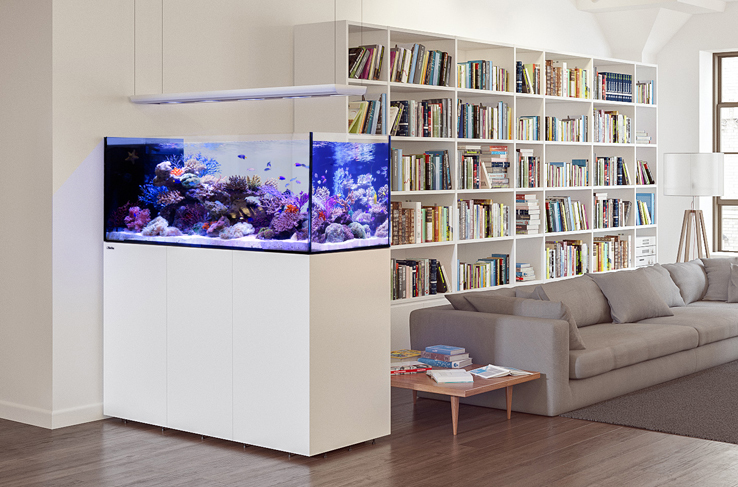 Red Sea is now adding to it’s lineup with two new peninsula style aquarium models. These models are the Reefer Peninsula 500 and 650 which are viewable from the front and the back as well as one of the ends. 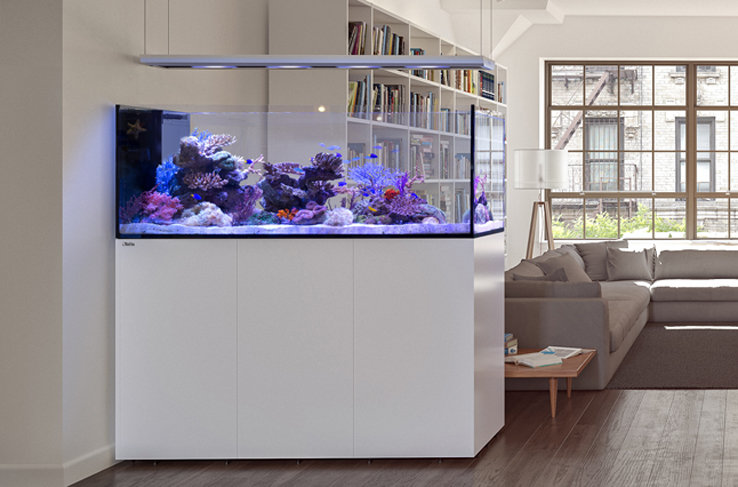 Like all of the Reefer series models, the peninsula aquariums will feature rimless low iron crystal clear glass, marine-spec cabinetry, a sump system and an overflow box on one end of the aquarium with a place to add 2 wave maker pumps when additional circulation is required. 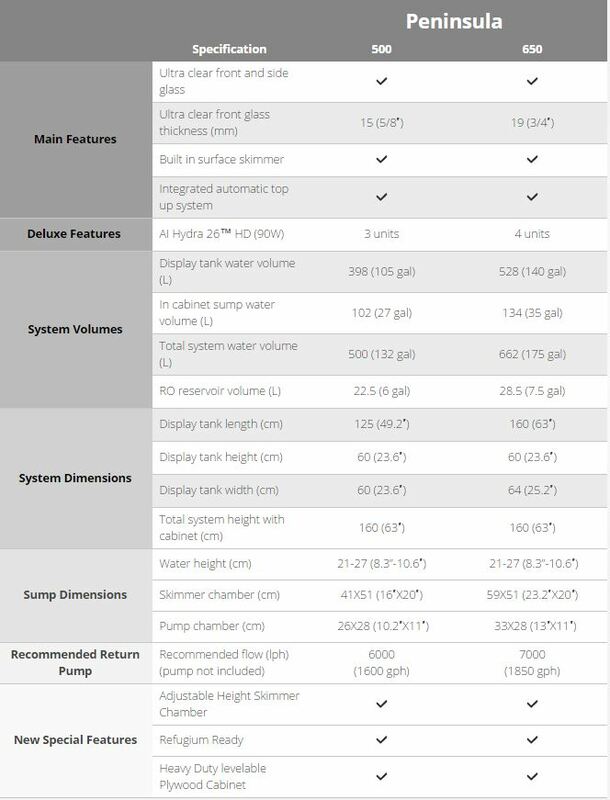 The Peninsula Reefer 500 is 132 gallons and the tank dimensions are 49.2″ L x 23.6″ W x 23.6″ H while the 650 model is 175 gallons at 63″ in length, 23.6″ W and 25.2″ tall. The peninsula offers all of the features found in the Reefer series and is great as a room divider or partial room divider. 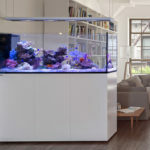 Because the tank is viewable from the front and back, unique and interesting aquascapes can be created on both sides of the aquarium with the potential to add even more corals and sessile organisms to the display. 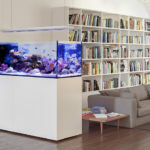 Both models will be available with white or black cabinets and with or without Aqua Illumination Hydra TwentySix HD lighting fixtures that are housed into a custom fixture designed by Red Sea. This is displayed in the picture below. 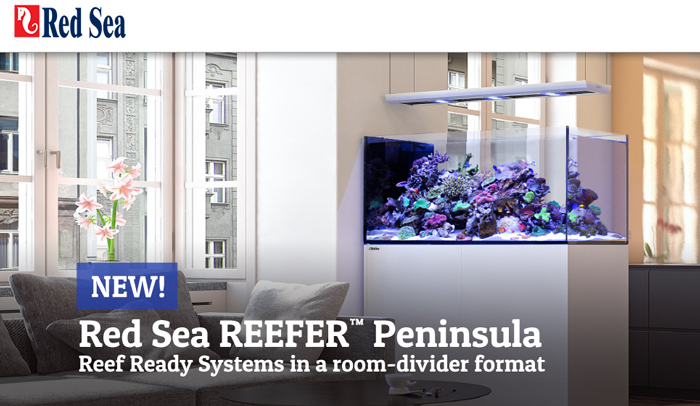 Red Sea expects to begin shipping Peninsula Reefer aquariums to dealers in June of this year. Pre-orders are already begin taken by some online and retail stores. 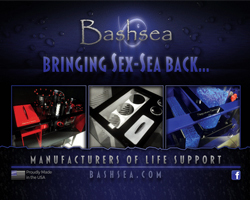 For more information visit RedSea.